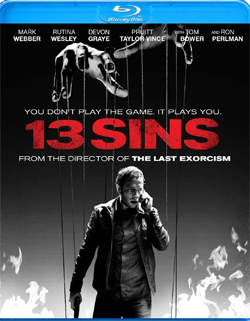 (Release Date: June 17, 2014)  "13 Sins" has got a humdinger premise and a grippingly spun narrative on its side. What it doesn't have is a satisfying payoff. Written and directed by Daniel Stamm (2010's "The Last Exorcism") and co-written by David Birke, this slickly mounted "what-would-you-do?" thrillera New Orleans-set American remake of the 2006 Thai film "13: Game of Death"draws the viewer in from the squirmy, attention-grabbing prologue. As the main story proper gets under way, the film introduces us to a down-on-his-luck salesman named Elliot (Mark Webber) who is about to lose his job and quite possibly his home mere days before his wedding to pregnant girlfriend Shelby (Rutina Wesley). The mounting stack of pressures are becoming too muchhe also has an autistic brother (Devon Graye) to care for and an elderly father (Tom Bower) residing in an assisted living facilitywhich is probably why it's an easy decision for him when he receives a mysterious phone call from an upbeat game show host (chillingly voiced by George Coe) asking him to participate in 13 challenges for the chance to win up to $6.2-million. They start out relatively innocuousthe first one is to kill a fly for $1,000, the second is to eat said fly for over twice that amountbut with each incremental step the challenges grow darker and more twisted. If he completes all 13, he will be a rich man. If he doesn't, his bank deposits will vanish without a trace. The question of what a person would do and how far he or she would be willing to go for the promise of financial security is not exactly a novel ideait spans as far back as François-René de Chateaubriand's 1802 tome "Genius of Christianity," was the basis for Richard Matheson's 1970 short story "Button, Button" (later adapted into 2009's "The Box"), and even 2013's "Would You Rather" and 2014's "Cheap Thrills" covered similar territory in the last sixteen months alonebut it is a universal, consistently fascinating query that never goes out of style. "13 Sins" is a macabre film, but there is a sense of playfulness to its tone that keeps it from getting too heavy or demanding. Mardi Gras imagery and the circus-themed ringtone signaling calls from the game show host bring foreboding locational atmosphere to the proceedings, while Mark Webber (2012's "For a Good Time, Call...") is compelling as "contestant" Elliot, faced with sacrificing his moral code and his relationships as he passes the point of no return. As Detective Chilcoat (Ron Perlman) starts investigating the wave of crimes happening throughout the city and an obsessive guy (Pruitt Taylor Vince) comes into view with a scrapbook of proof that what Elliot is going through is not a solitary occurrence, one patiently waits for a third-act raise of the curtain. Instead of providing much insight, however, director Daniel Stamm takes the picture in a more listless, far-fetched direction culminating in a series of increasingly silly plot developments. The ending, which doesn't take the time to truly consider the sacrifices Elliot has made, finishes with a whimper that leaves the last 92 minutes feeling kind of pointless. "13 Sins" almost deserves a pass for the enthusiasm with which it has been made, but the film's path leads to a disconcerting dead end. "13 Sins" was shot digitally by cinematographer Zoltan Honti on location in New Orleans, and the textured southern history and architecture of the Louisiana city comes through loud and clear within the film's deft high-definition transfer. The 5.1 DTS-HD Master Audio track makes good use of the front and rear channels, providing a full, enveloping experience, but there is one niggling issue: the voice of the game show host over Elliot's cell phone is sometimes slightly muffled and distorted within the sound mix. Because of this, the viewer has to really strain to make out everything he is saying. English subtitles (which are thankfully included) will help to solve this, but it still warrants mentioning. Audio Commentary with Director Daniel Stamm and Actors Mark Webber, Ron Perlman and Devon Graye; "The Making of '13 Sins'" (8:38, HD); Deleted Sequence (5:50, HD); "Anatomy of a Meltdown" (2:42, HD), and an Alternate Ending (2:01, HD) that is far more successful and ominously suggestive than what made it into the finished film. "13 Sins" is a diverting horror-thriller that sadly makes a number of wrong decisions which compromise one's aftertaste of the film. The alternate ending provided in the special features is so much stronger than what was finally chosen that its inclusion is akin to a slap in the face. All the same, Anchor Bay Entertainment's Blu-ray of "13 Sins" is excellent and comes with an informative audio commentary and a quality, if too brief, making-of featurette. Director Daniel Stamm and his actors are so positive about their experience that it almost makes me feel guilty having to give the movie itself a lukewarm review. Because this high-def package is so strong, however, it is easier to recommend that prospective consumers at least check the film out for themselves on this format.